The Silk Road has always fascinated travelers from all over the World. The ancient network of trading routes connected the East and the West for centuries, making possible the trade between lands like China and Europe. The Silk Road is certainly the biggest trading network from the antiquity, and its importance didn’t decline until just a few centuries ago. Even today countries like China still want to revive it, with projects like the One Belt One Road Initiative. Such a vast network attracted huge amounts of people. The major trade hubs soon became wealthy and known all over the globe, and in the heart of the Silk Road was modern-day Uzbekistan. 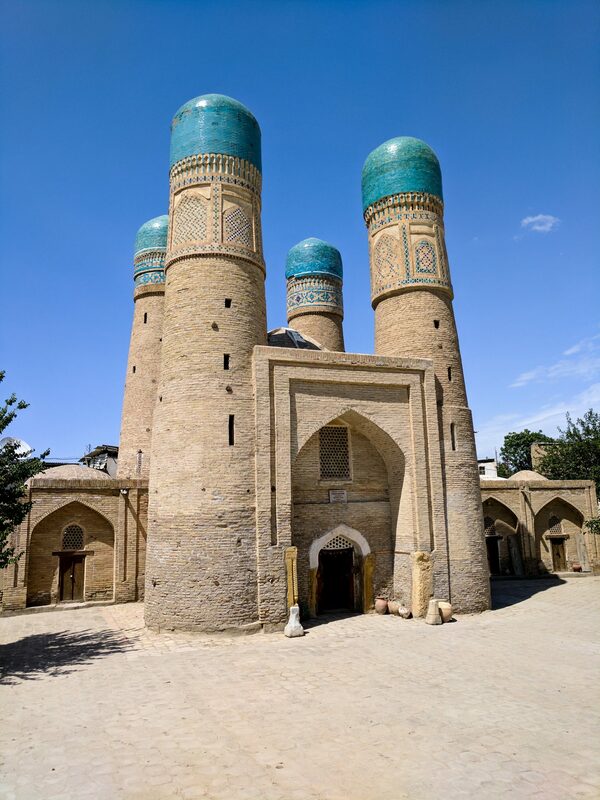 Cities like Khiva, Bukhara or Samarkand were for centuries synonymous with wealthy, prosperity and trade. Today some are modern cities where we can still find there the traces of the past, but others manage to transport the traveler ages ago, to the time of its prime. 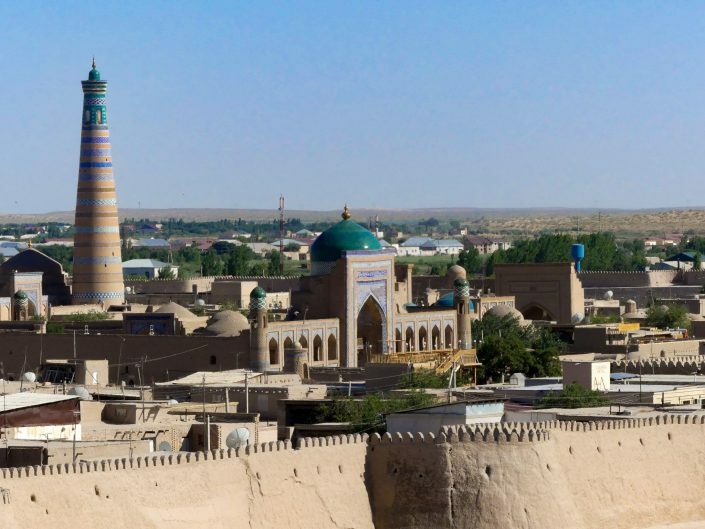 The city of Khiva is located at the West of Uzbekistan, very close to the border with Turkmenistan. It’s not as ancient as other cities from the Silk Road, being mentioned for the first time around the 10th century, and with archeological evidences of habitants in the 6th century. 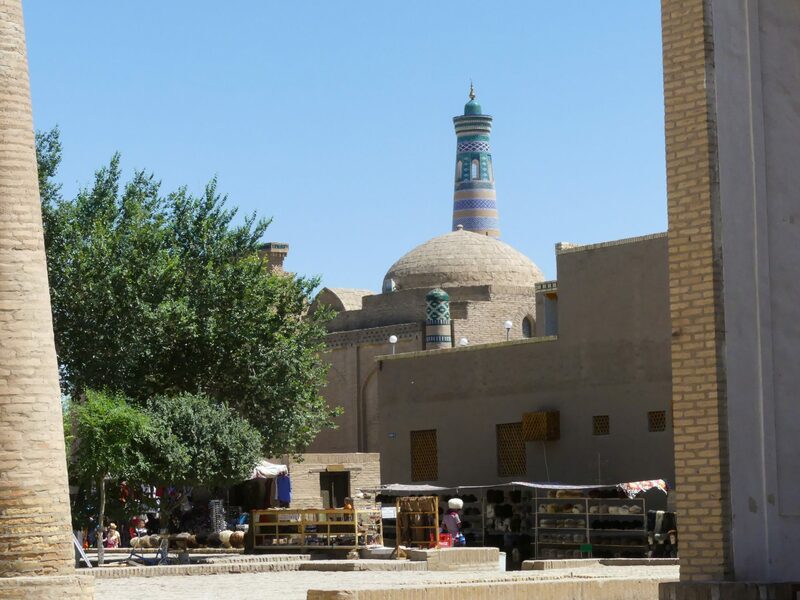 Khiva is split in two parts. 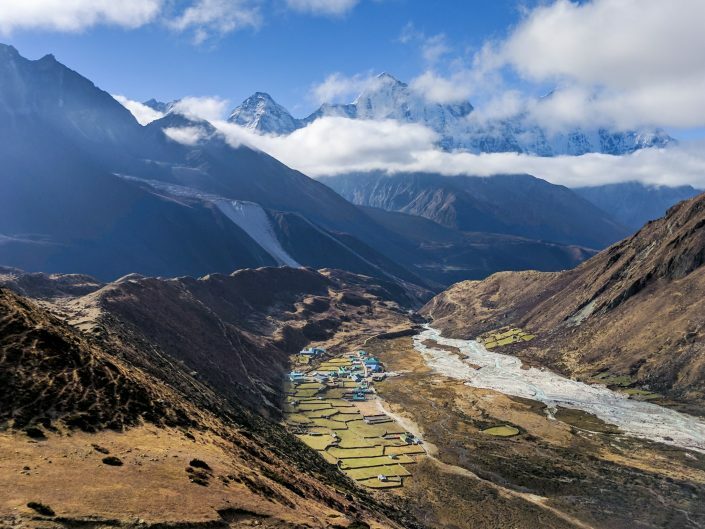 The outer town, called Dichan Kala, and the inner or walled town, or Itchan Kala. The inner town is one of the places where you can breath the spirit of the Silk Road. This area, completely surrounded by a 10 meters wall contains hundreds of old houses and historic monuments, and is also a UNESCO Wolrd Heritage Site. 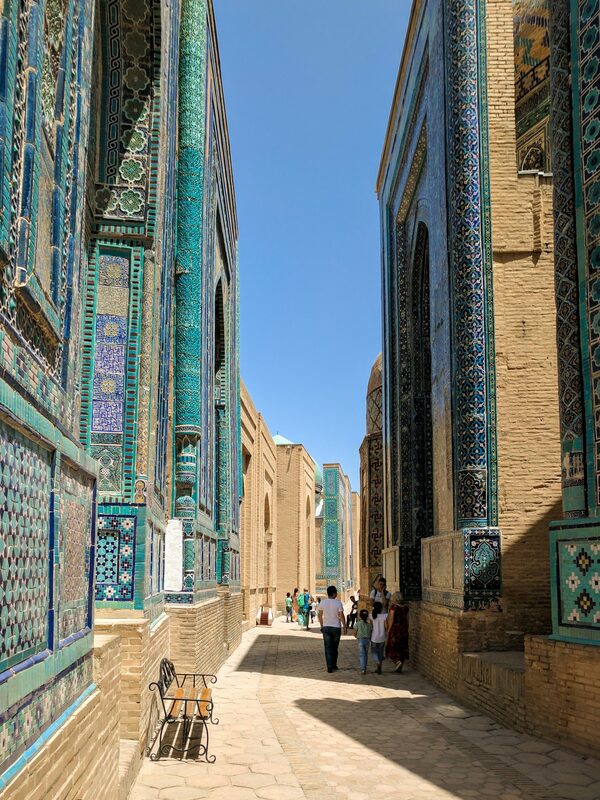 Walking through the streets brings you back in time, to the days of the Khanate of Khiva and the city thrived thanks to the slave trade. 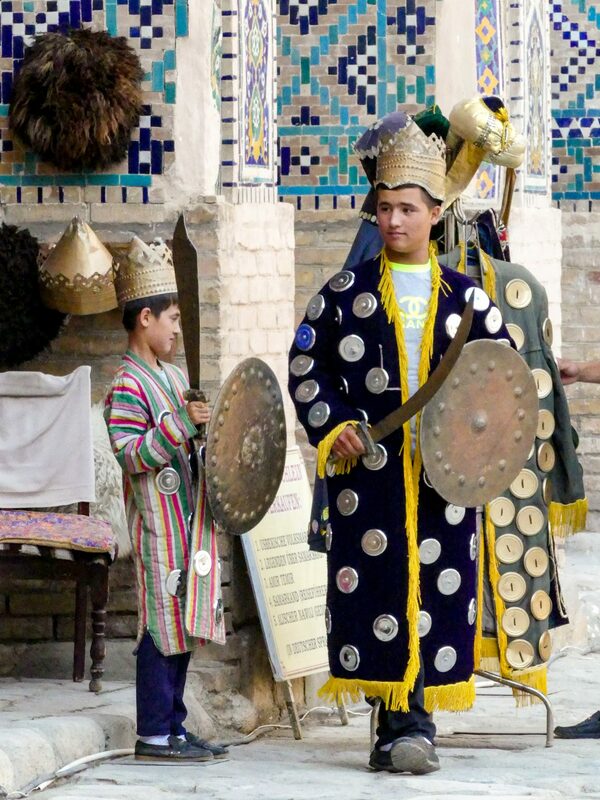 Turkmen tribesmen would capture slaves in the steppes, and travel to Khiva to sell them there. It was the bigges slave market in Central Asia, to the point where one of the reason of the conquest in the 19th century by the Russian Empire was the increasing amount of Russian slaves being sold there. Despite the dark history of the city it is a beautiful place, where no matter were you go you will find madrasas, mausoleums, mosques and palaces. The old town is like a huge museum. 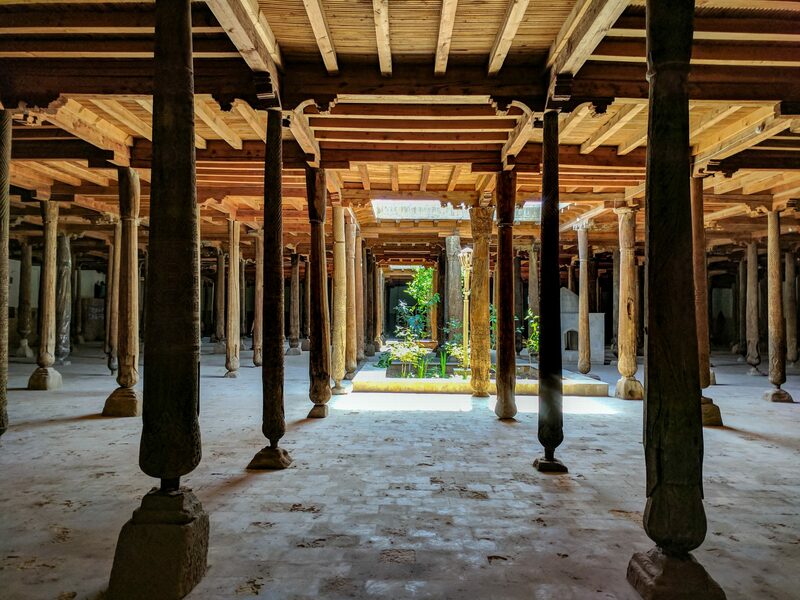 One of my favorite buildings was the 18th century Djuma mosque, built with 212 wooden columns, which gives it a dreamy look. 21 of this columns are really old, from the 10th-12th centuries, and decorated with Arabian inscriptions, while the moderns ones have floral patterns. When I was in Bukhara a young local woman in charge of a shop told me that people go to Uzbekistan to see Samarkand but always end up liking Bukhara more. And while that’s up to the traveler I can see why she said that. 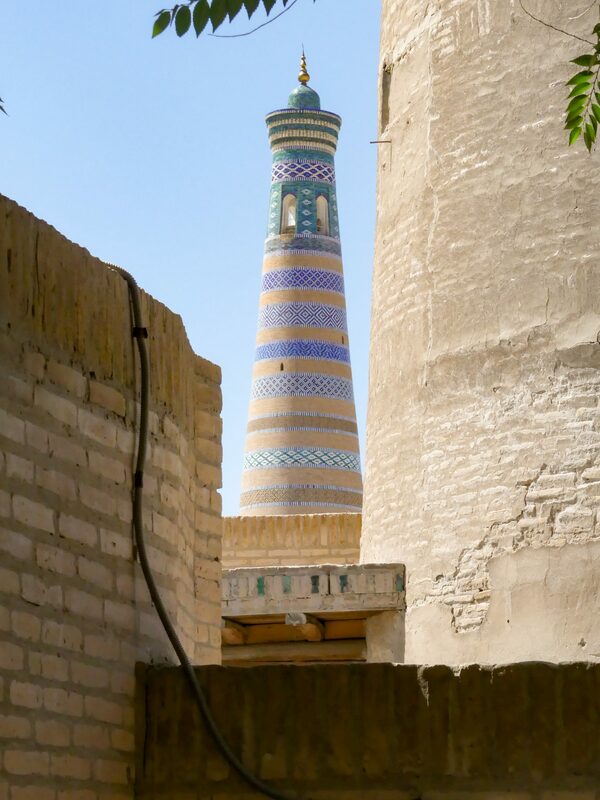 Bukhara or Buxoro has many similarities to Khiva. The old town is also a UNESCO Wolrd Heritage Site and a museum city. It is fairly big, with a population of 250,000, and famous for the big amount of historic buildings that contains. It even has its local celebrity, the Emir of Bukhara, which ruled before the anexation of the Emirate by the Russian Empire. Today you can find him everywhere, and buy keychains or small figurines of him. Founded in the 6th century B.C. the town is filled with historical buildings, some of them dating back to the 12th century, like the Kalyan minaret. This 48 meters building was built in 1127, and it impressed so much Genghis Khan when he conquered the city that he ordered it to be spared, unlike everything around it. Other buildings, like the Chor Minor, built in the 19th century, are more recent. This one is one of the most famous one, specially for being the cover of the Lonely Planet Central Asia guide. Like most mosques and madrasas in the country it has a souvenir shop inside, something that I found very funny after a few weeks in Iran, where that would definitely be frown upon. Lyab-i Hauz, the old square in the middle of the city can be quiet and peaceful, with people gathering around the pond to eat or play games. But it can also be vibrant in the evening, when the people go there to hang around, the street markets open and the kids run around playing. The pond is surrounded by two madrasas and a khanaka (which is some kind of lodge for Sufi travelers) from the 16th century, and it’s one of the most beautiful areas of the city. Apparently the ponds where everywhere in the city prior to Soviet rule, acting as a source of water. Sadly there also spread the disease through the city, including an infamous episode centuries ago where the Plague infected a lot of people. Kalyan minaret and mosque in Bukhara. They used to throw people from the minaret when they where convicted to death! The city of Samarkand was one of the greatest cities of Central Asia, already famous in the 4th century B.C, where Alexander the Great conquered it. Alexander himself said ‘Everything I have heard about the beauty of the city is indeed true, except that it is much more beautiful than I imagined’ when he took over it in the year 329 B.C. Sadly we would never see the same city as Alexander, the city was part of many empires after that and even conquered by the Huns. By the 3rd century the city was just a shade of its former glory, and didn’t really revive until centuries later. The city flourished again during the Golden Age of the Silk Road, after Genghis Khan conquered most of Eurasia. The massive mongol empire meant that, for a long period of time, there was peace all along the Silk Road. This peace, and the protection of the caravans under the Khanate, attracted traders, merchants and travelers from all around the world. This is the time of travelers like Ibn Battuta or Marco Polo. 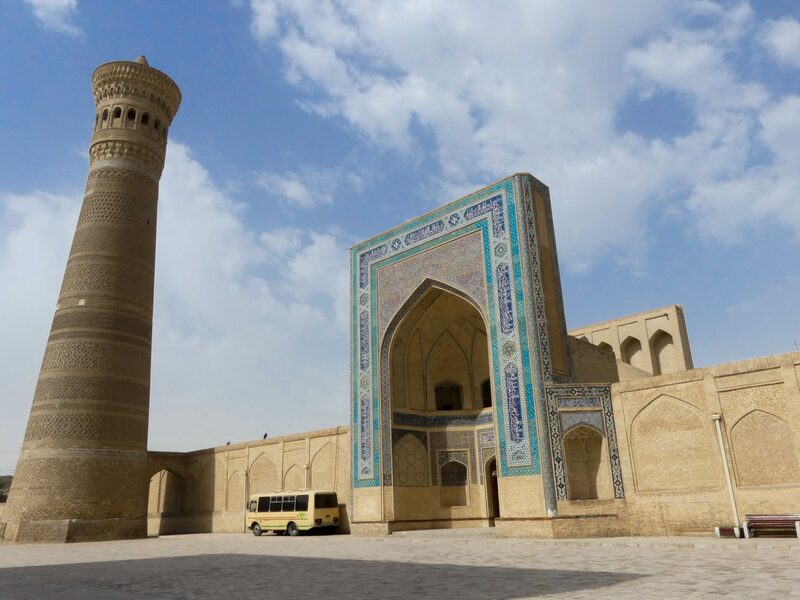 they described Samarkand as ‘one of the greatest and finest of cities, and most perfect of them in beauty’ and ‘a very large and splendid city’ respectively. 150 years later Timur built his empire over the ashes of the mongol khanates, now divided. He made Samarkand the capital and became a patron of the arts, bringing artists and builders from his conquests to reshape the city. After the Timurid empire the city started declining again and switching hands between local rulers. 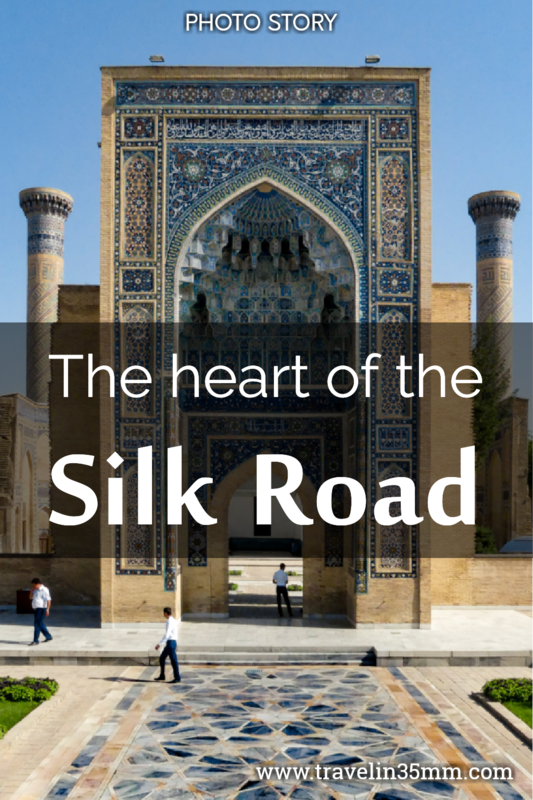 As the Silk Road lost its importance Samarkand became more and more irrelevant in the global trade. In the 19th and 20th century, under the Russian rule, the city changed even faster, specially in the time it was under the USSR. 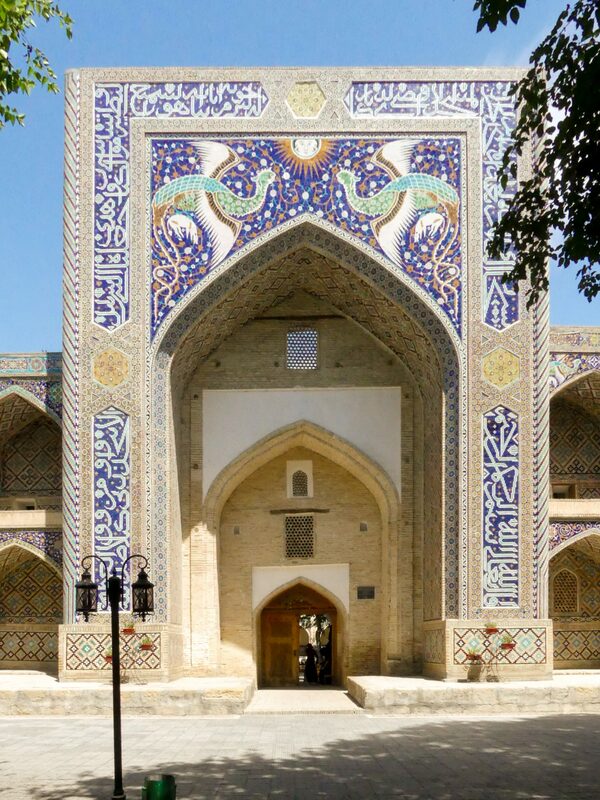 Today Samarkand is a big and modern city, nothing to do with Khiva and Bukhara. In order to visit the sights you have to either walk a lot or take a taxi (or local bus). 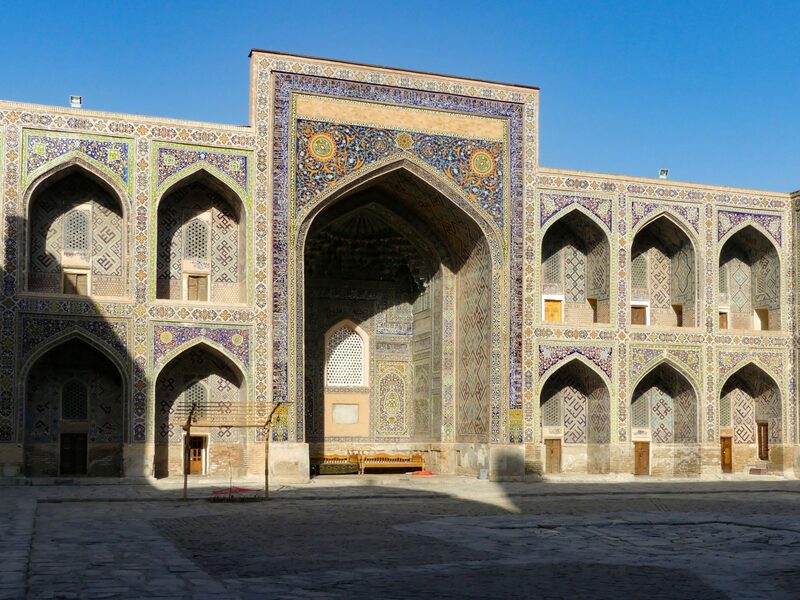 Despite the lack of and old town the historic buildings are stunning, specially the Registan, a huge square with three madrasas surrounding it. Another impressive sight is the Lyab-i Hauz, the necropolis where the relatives of Timur are buried. 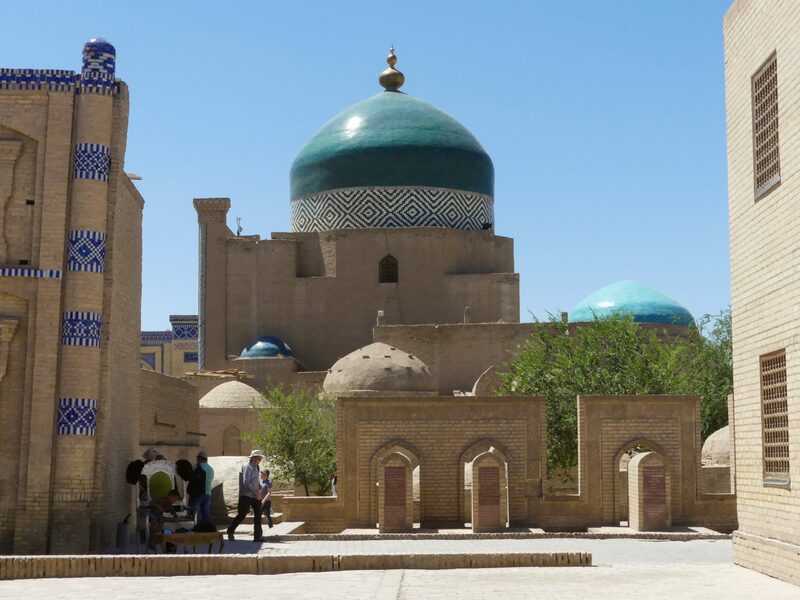 There are many impressive mosques and madrasas too, and of course the mausoleum of Timur himself is also there. 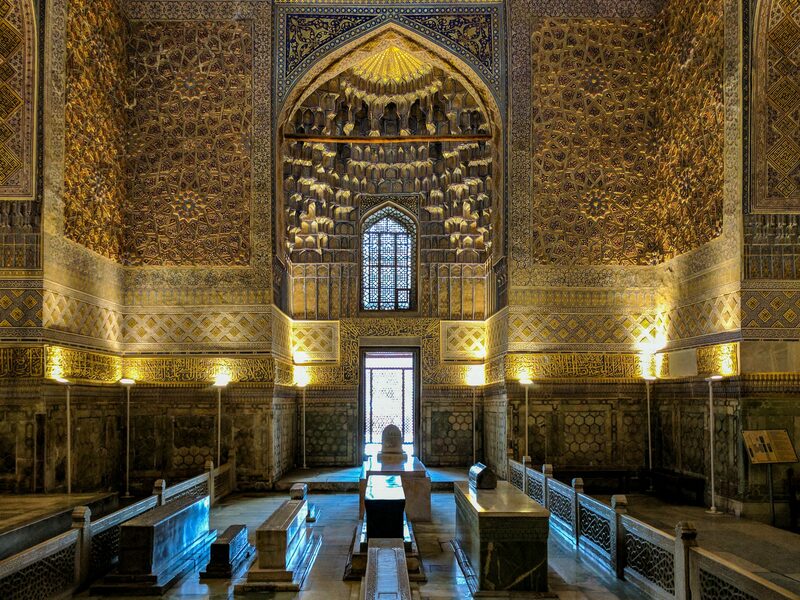 Other notable people are also buried with him, including the famous astronomer Ulugh Beg, who built an observatory in Samarkand and created what is considered the greatest star catalogue until the Tycho Brahe one, and measured the length of a year with an error of 58 seconds. love this! 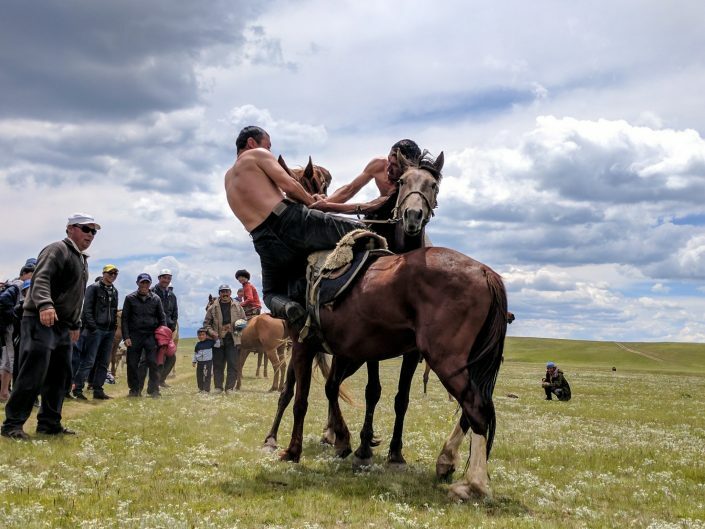 I am booked to go to Uzbekistan in june and am visiting all 3 of these cities – am even more excited after reading your post. Do you have any restaurant recommendations? I am planning to go to the Silk road in China in this coming June. I have been to part of the Silk Road in Konya Turkey. 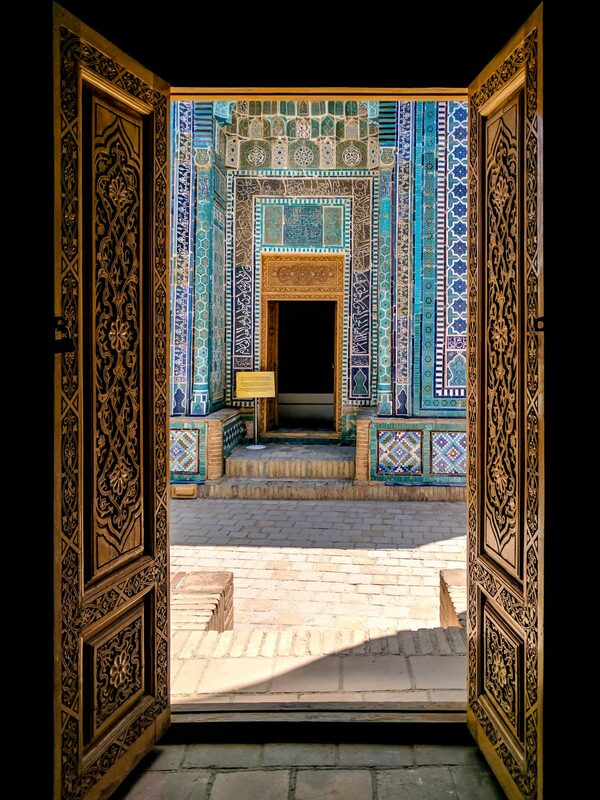 I have not got the guts to travel Uzbekistan yet as I have not have enough information about this country. Looking at your pictures, make me think twice and I should make a trip after my silk road in China. I love those buildings which also engrave with the calligraphy and the intricate details. You should definitely go! Uzbekistan is a wonderful country, and sadly not a very famous one. I believe it’s also where you can get the feeling that you truly are in the Silk Road, since it has so many historic buildings so well preserved. Wow, I’ve never been to Uzbekistan Yet, and these cities you’ve featured will surely be penned on my list of places to visit. I love all the intricate design of those buildings, very detailed and fine. I hope to traipse my feet here soon. Thank you so much for sharing this with us. Oh by the way, your photos are really stunning! 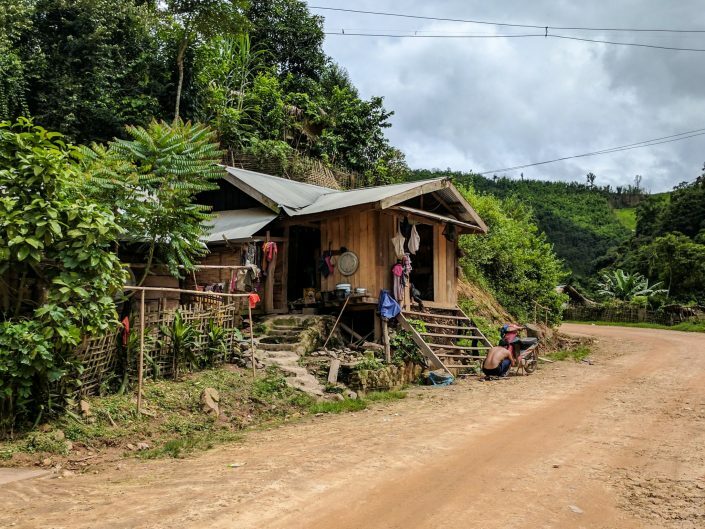 I love that your posts gave us a glimpse of these places. The only silk road I’ve been to is the Caucasus side. Hopefully I get the chance to see these places in the future. It’s really interesting. Your photos are really inspiring. I knew this would be an awesome post the moment I saw the title. Uzbekistan is such an underappreciated country even though it is blessed with all these beautiful historical monuments. This is going into my bucket list for certain. Amazing photographs as well. I particularly enjoyed the one with Djuma mosque in Khiva. Samarkhand is just making me speechless!